We added the Followers gadget on the bottom of the page, to make it easier for you to stay on top of all thing Skywatch Friday! 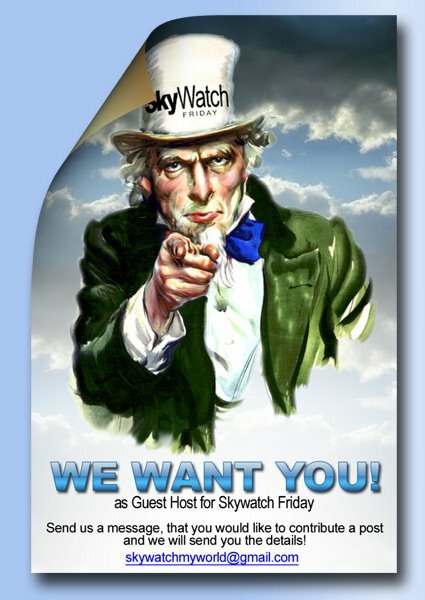 Today we want you to get on the Skywatch Front Page with your best Skywatch image! Interested? Drop us a note and we send you the info on how to make the headlines! ;) Please make your request via eMail only and do not send images right away. Please wait until you receive our response. Of course we can't get Skywatch rolling without a proper Sky Image. So here we go! Happy Thanksgiving to all that celebrate it today! Hello Skywatchers! Glad you're on board again! We encountered some problems in the recent weeks, which involve popup ads, that are triggered by Gadgets. They are available for Blogger and other platforms. These are linked to Clicksor, a company that provides very devious and annoying ads, that are hidden within these Gadgets. In all cases we encountered, these gadgets came from a company Compteur.cc and are variations of Counters. We will delete every site from Mr. Linky, that is using these gadgets, to prevent you - our visitors from getting annoyed by them. We know that basically all site owners, that use these counters are not aware of the "Side effects", but we simply do not want to send visitors to sites, that will greet them with these ads. If you're a site owner - check your gadgets if they come from the above named company. If you want to participate in Skywatch or MyWorld, please remove them. At the same time we would like to remind you, to read and follow the rules. These rules are there, to provide you - the visitor with a pleasant experience. We want to make sure, that every participant has equal chances to be visited. We do not want you to run into commercial sites, that try to take advantage of you, in sites, that sign up, but don't have any Skywatch or MyWorld content, or that let you search for a post, that you came to see. So please! If you sign up, mark your Post as a Skywatch or MyWorld post and provide a link back to the Skywatch or MyWorld site, to invite others to join or watch. If you have a commercial site (reviews, Ads etc. ), please ask for permission to join, before signing up. If you have questions, or if you find your link has been removed - you can contact us at skywatchmyworld AT gmail DOT com. Our today's host is our very own Wrenessaince Woman - or short Wren, who joined the Skywatch and Myworld team. Even though I first joined this meme less than six months ago, it's rapidly become a regular and favorite part of my blogging world. So simple, it sounds, to just post a photo which shows the sky. And yet ... 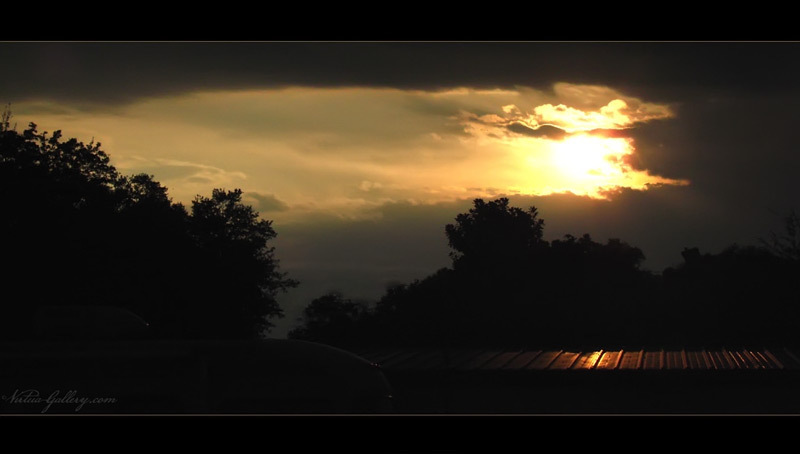 I think of the sky, the world, and my photos differently now. This photo is one from our recent visit to Paris. The blue background is 100% pure blue French sky. I like the balance of the distant church and the nearby light post, and the topsy-turvy relative sizes. I am most pleased to be joining the Skywatch team and helping to bring this meme into being each week. Thank you for joining us, for sharing your photos, and for being part of our community. Happy Skywatching, everyone! I'm glad to announce that we have an addition to our team! Louise is joining the team of Skywatch and MyWorld! Give her a warm welcome! And - like in MyWorld - we added the Followers Gadget at the bottom of each page - to make it easier for you to keep track of Skywatch! But now I hand over to the dweliciously knowledgeable DewDrops - our Sky Goddess for another of her great Sky lessons! Here's lesson five. 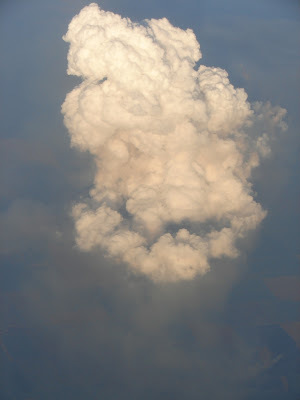 I have chosen a pyrocumulus cloud that I captured from an airplane as we flew by a fire on the ground. A pyrocumulus cloud is produced by the intense heating of the air from the surface. The intense heat induces convection which causes the air mass to rise to a point of stability, usually in the presence of moisture. Phenomena such as volcanic eruptions, forest fires, and occasionally industrial activities can induce formation of this cloud. Pyrocumuli contain severe turbulence which also results in strong gusts at the surface which can exacerbate a large conflagration. Large pyrocumuli can contain temperatures well below freezing, and the electrostatic properties of any ice that forms may also play a role. A pyrocumulus which produces lightning is actually a type of cumulonimbus, a thundercloud and is called pyrocumulonimbus. This shot was taken flying out of Memphis, TN, in June 2008.